For people with less time we offer the 11 day KeaRider motorcycle tour Route 66 Kicks, which takes you from Chicago to Los Angeles through eight states. Pass through the Gateway to the West in St. Louis and see the unique natural wonders in the Wild West, including the Grand Canyon, Monument Valley, and the Petrified Forest near Gallup. On your road trip you will spend the nights in individual motels and hotels and eat in typical Route 66 restaurants, where hearty American dishes are cooked. In the ghost town of Calico you will experience the Wild West, before your Route 66 motorcycle tour comes to an end on the Pacific coast in Santa Monica. After an individual journey, tour participants meet in Chicago and head through Illinois with a stop at the Route 66 Hall of Fame. Accommodation is in Springfield. Today you drive to St. Louis, the "Gateway to the West" with the well-known 190 m high steel Gateway Arch, you can visit the lookout at the top. Leaving St. Louis our motorcycle tour goes through Missouri to the well known limestone caves Meramec Caverns, where once the outlaw Jesse James hid from his pursuers. Today one of the longest stretches of this motorcycle tour is on the agenda: straight through the Midwest, the journey goes through Missouri and Kansas and continues on to Oklahoma. After spending the night in Oklahoma City, you will reach the West today: you have the option to visit the Route 66 museum in Clinton and the Cadillac Ranch, where ten Cadillac's are vertically stuck into the ground to commemorate the golden days of the Route 66. Accommodation is in Amarillo. 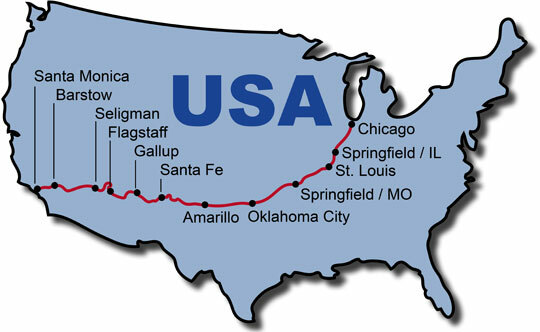 Today is a special event: in Adrian, you will reach the middle of the old Route 66. In the evening, you will arrive in the historic city of Santa Fe, where you will spend the night. The first highlight of the day is a visit to Madrid, where John Travolta filmed the biker cult movie "Wild Hogs". You will cruise through New Mexico past Mesas, Table Mountains and mission churches and spend the night at the El Rancho hotel in Gallup, where once many Hollywood stars stayed while filming Western movies. Today you will discover a natural wonder the Petrified Forest and the Painted Desert in Arizona. Overnight stay is in Flagstaff. From Flagstaff we head on to the famous Grand Canyon and here you have the possibility of flying with a helicopter, before your road trip continues on to Seligman to the Route 66 Visitors Center. Today you will ride through the exciting Mojave Desert to the Ghost Town of Calico with its old silver mine, before ending the day in Barstow. Your Route 66 tour is coming to an end: from Barstow you will ride your last part of Route 66 to Victorville before heading to your final destination in Los Angeles, where you start your individual journey back home.